I had the pleasure of helping a sweet couple and their previous office space. They had this room that had several big surfaces- which we all know can start to become “Storage” places. When they had something that did not have a designated spot in their home, it went into this room. Now the lovely lady of this home has a passion for quilting. 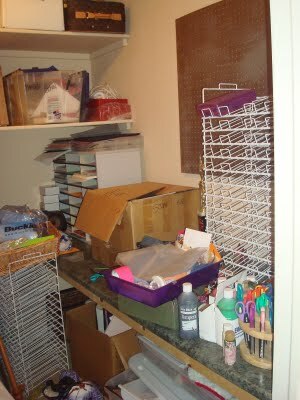 She has several quilting items and fabric, but she needed a place to work on them and store it all! Before this transformation, she would do it in the living room on the coffee table. She decided that she wanted to transform this space into her quilting room- because it would be the perfect space for it! She just needed some encouragement and guidance on how to tackle this project!